DuraKapp™#1 is a Lead-free, Tin-based Babbitt known for its ability to withstand high pressure, high temperature, and friction. 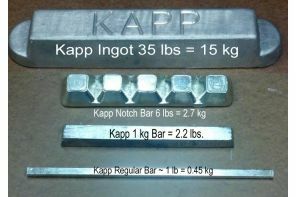 Kapp Alloy combines high purity virgin raw materials and our proprietary Precision Microcasting™ process to create the world’s strongest, most consistent Tin-based Babbitt. It is available in a variety of forms such as: ingots, notch bars, and bars depending on your application. DuraKapp™#1 Babbitt meets or exceeds the specifications for ASTM #1 Babbitt - also known as #1, No. 1, or Grade 1 Babbitt. We back all of our products with a 100% satisfaction guarantee or your money back. 10 mm ball/500 kg load-30 sec.